Hammerworks handcrafted Antique Wall Sconces S131 is the 2 arm version matching the Rustic Style Wall Sconce: S131A. Therefore you have more options when you choose these classic Colonial Wall Sconces. The versatility of having 2 options to choose from within the same style is advantageous if there are space constraints. No matter what, the classic simplicity of these Antique Wall Sconces means that you can easily combine with any style within our collection. Most importantly we use only solid copper, brass or tin to create Vintage Wall Sconces. Consequently this allows you versatility in coordinating with the color scheme and style of any setting. Therefore home styles from a classic Williamsburg Colonial to a Cape Cod Style Cottage or New England Farmhouse are suitable for any of our Rustic Tin Wall Sconces. As a result our Antique Wall Sconces combine beauty and function making them a perfect decorating accessory for any home. No matter which Colonial Tin Wall Sconce you choose, you will find that they are beautiful in their simplicity. They provide a warm glow, perfect to illuminate a dark hallway or accent lighting in a bathroom, bedroom or living area. 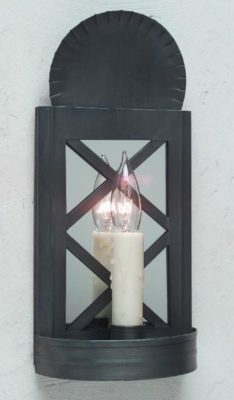 In addition we offer several Colonial 18th Century Tin Wall Sconce styles with 2 or 3 candles. Thus they are ideal for areas requiring additional lighting. Furthermore each sconce is UL listed and can accommodate 60 watts per candelabra socket. Our collection of Colonial Ceiling Lights go hand in hand with any of our Classic Design Tin Wall Sconces. You will be delighted with the charm of the Pierced Tin Ceiling Lights CL116 or Punched Tin Ceiling Lights CL117. In addition the simplicity of Tin Ceiling Light With Seedy Glass CL114 makes it suitable in any location. As always you can choose from antique copper, brass or tin along with custom painted black finish options.